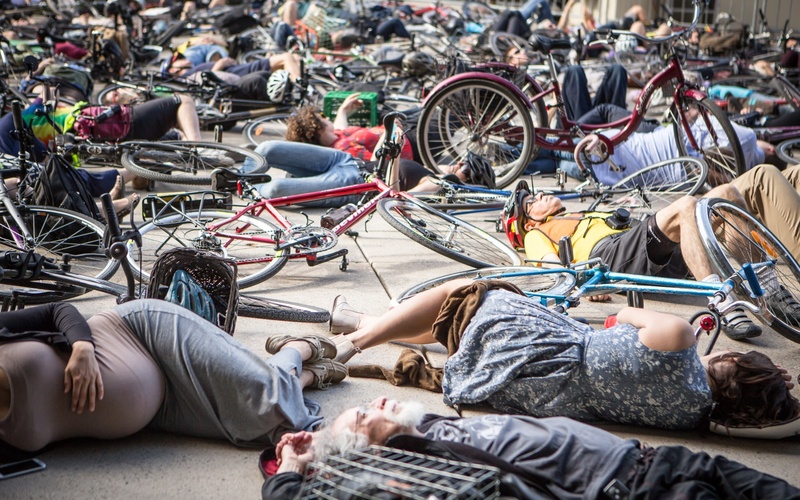 Cycle Toronto die-in, June 2015. Jesse Milns. On June 19th, City of Toronto officials on their way to work had to step over the bodies of hundreds of cyclists lying in front of the entrance to City Hall. A week later, the busy intersection in front of the Bank of England in central London was shut down by a similar spectacle. And in January, business on Capitol Hill in Washington, D.C. was briefly interrupted by several dozen people of various religious backgrounds spontaneously dying in line for lunch. Thankfully, the people involved in these incidents didn’t stay dead for long. Just a few minutes, in fact, long enough to create some visually arresting photo-ops, and to make their point. In London and Toronto, it was that cyclists are being killed by cars; in Washington, that young black men are targets for police violence. 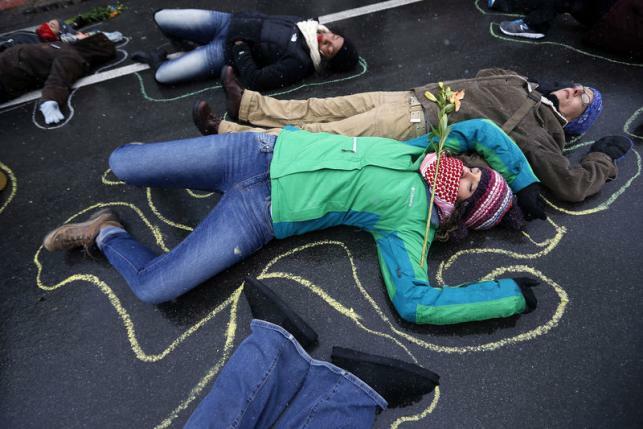 Different places, different causes, but the same tactic: the die-in. When did playing dead become a way of speaking out? Quite a while ago, it turns out. While the die-in has never been more popular than in the last 12 months (more on that later), it has fifty years of history behind it. I began to look into that history in 2012, while researching early cycling activism in Montréal. One pioneering group, le Monde à bicyclette, became famous in the 1970s for organizing die-ins in the most inconvenient places: the Montréal Auto Show, or the middle of St. Catherine Street on a Saturday. The idea was to show just how murderous the automobile was, and participants really got into it, sprawling convincingly across the ground sporting bandages soaked in fake blood. There was even a fake ambulance service. One thing that immediately struck me was how well-organized the die-ins were. 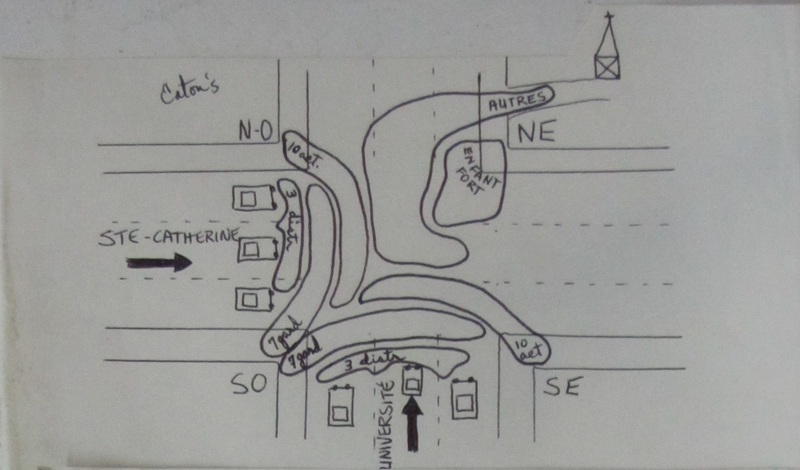 Everyone had assigned places and roles, there were cues and timings, and measures were put in place to protect participants from over-zealous motorists. This was not something Montréal cycling activists were making up on the fly. Die-in plan, 1970s. Le Monde à bicyclette Archives. The fact is, by the mid-1970s the die-in was an established part of the repertoire of non-violent action used by social movements across North America and, to a lesser extent, in Europe. Local groups learned about the tactic—and how to implement it—from newspapers, activist publications, and direct contact with organizers from other cities. 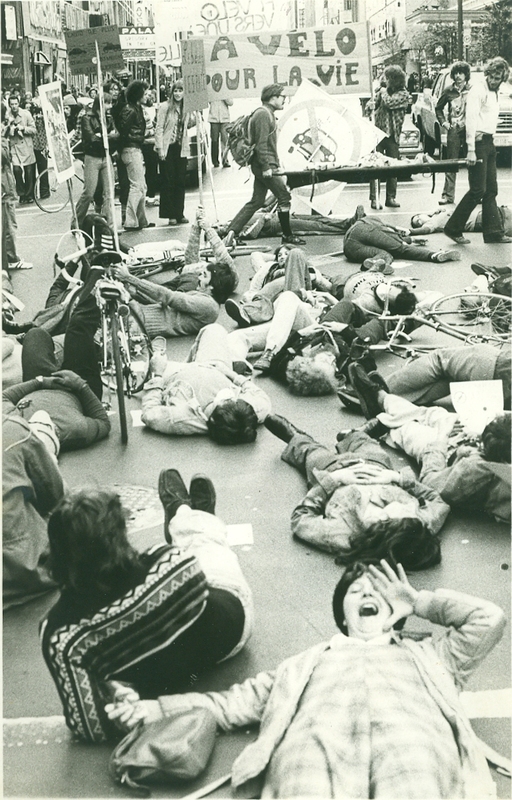 In the case of le Monde à bicyclette, inspiration came from news reports of a 1972 Philadelphia protest in which 420 people simulated death to protest nuclear weapons testing. In this early period, dying-in was particularly popular in the anti-war and environmental movements. * Why? I’d guess because calling attention to death—and its potential to be hastened by war-mongering or unabated pollution—was so fundamental to the success of both causes. One of the first references to the term “die-in” is in coverage of a protest organized by Boston environmentalists to mark the first Earth Day on April 22, 1970. A few dozen people, some with makeshift coffins, faked death in front of ticket counters at Logan International Airport to raise awareness of pollution. Other early examples include a People Against Nerve Gas demo in Seattle (then a hub for transporting the stuff) in May 1970, and a huge Women Strike for Peace protest in New York in 1972. 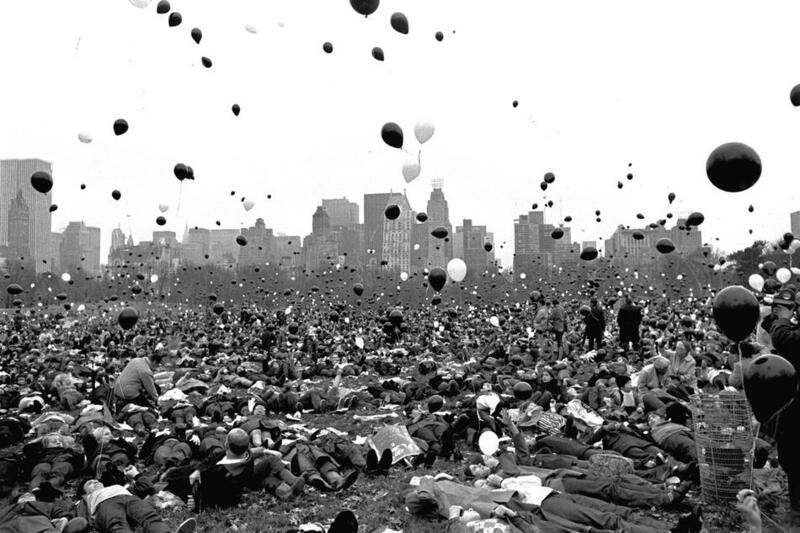 1969 “lie-in” protest against the Vietnam War in Central Park, NYC. J. Spencer Jones. Most die-ins happened in the following way: a surprise take-over of a busy public place by protesters; a theatrical “death,” often with props like coffins or bloodstained rags; and a hasty departure, sometimes facilitated by the police. There might be slogans or singing, but the shock value was in silence. Dozens or hundreds of protesters playing dead turned an everyday space—a street corner, a hotel lobby—into a battlefield, an accident site, or something equally apocalyptic. A bit dramatic? Perhaps. One of the criticisms leveled at the tactic then (and now) is that it is really more about performance than educating the public or putting pressure on decision-makers. From the start, the die-in borrowed heavily from two traditions: civil disobedience and countercultural street theatre. Beginning as early as the 1940s, but becoming internationally visible in the early 1960s, American Civil Rights campaigners made non-violent occupations an integral part of their struggle. Black Americans and their allies marched, sat-in, and even lay-in to assert their rights to public space and equal citizenship. Their example of organized, dignified dissent was hugely influential on the 1960s and 1970s culture of protest around the world. By the late 1960s similar peaceful occupations were the bread-and-butter of the student and anti-war movements, to name just two examples. The Death of Hippie, 1967. Kaitlyn Thibodeau. 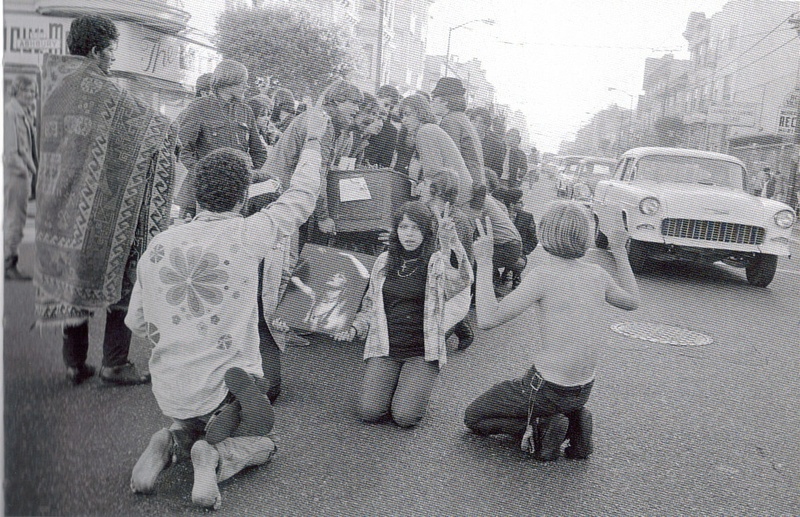 Equally important was the growing influence of the 1960s counterculture. Smearing yourself with blood and lying prone in a public space was a natural outgrowth of the ethic of shocking through non-conformity that ran through the counterculture as a whole. It also had its precedents in the guerilla theatre of groups like the San Francisco Diggers and Amsterdam-based Provo. In 1966 and 1967 the Diggers organized two widely-publicized mock funerals (for the concepts of “Money” and “Hippie”) that featured many of the trappings of 1970s die-ins, including coffins, mock solemnity, and grave pronouncements about the future. It was only a small step further to apply the performance to causes like air pollution or the war in Vietnam. As the images featured here suggest, that theatricality also meant great press coverage. 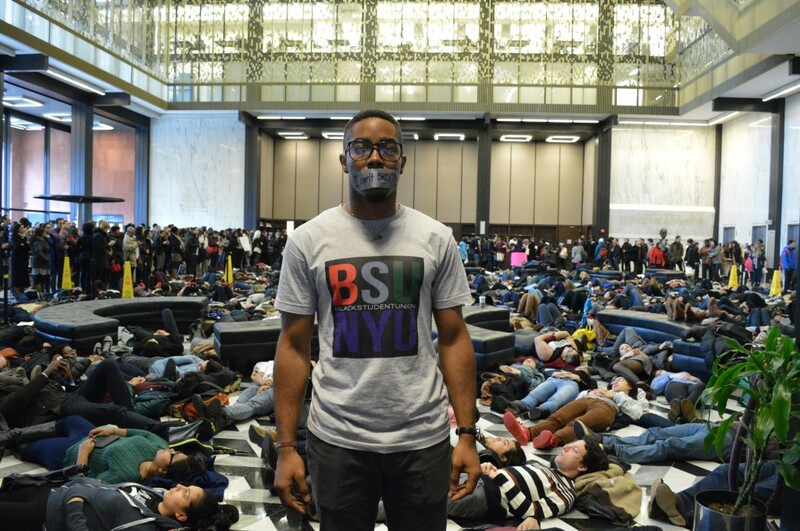 Peaceful protest has always been about being seen, but the die-in takes that to a new level. In that respect, it is less like a rally or a march—where the goal is at least partially to rally participants by creating a common experience—and more like a human chain, a naked bike ride, or other actions planned primarily as photo-ops (critics might call them “publicity stunts”). That’s not to diminish its significance. In fact, I think it’s the main reason why the die-in has suddenly become so popular in recent years, more popular than at any time since ACT UP’s organizing at the height of the AIDS crisis. The die-in is attention-grabbing, inexpensive, and easy to organize using social media: the perfect protest for the Internet age. That was abundantly clear in the wake of the police killings of two Black men, Eric Garner (New York) and Michael Brown (Ferguson, MO), in the summer of 2014. Across the United States, and eventually internationally, people organized die-ins that targeted not just public buildings, but shopping malls, department stores, and public transportation. Powerful images of people of all ages and backgrounds lying dead in solidarity with Garner, Brown, and other victims of police violence circulated around the world. Nearly fifty years old, the die-in still retains its capacity to shock. NYU, December 2014. Peter Slattery. * I’m grateful to members of the H-1960s group for their responses to my query about die-ins in 2012. 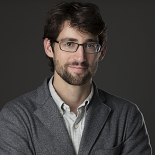 This entry was posted on June 29, 2015 by Daniel in Active History, activism, Montreal and tagged 1960s, civil rights, die-in, internet, media, protest.